"Thank you very much for a great day yesterday. I learned so much. I was polishing on the drive home and in my sleep all last night, trying to remember everything! Your notes will be invaluable, as we covered so much ground that I am racking my brain trying to remember it all, particularly sequence and timings. I am planning to follow your method rather that my book, because your results speak for themselves. I will be ordering the new materials later today, and will start practicing as soon as they arrive. Will you also thank your wife for her hospitality and work she put in to providing the very welcome lunch. It was very enjoyable and much appreciated." "The course was much, much more than I expected. Thank you for your time, patience and hospitality during the day. It was great, once again, many many thanks. Before and After photos of the table I finished at home:"
"Thank you so much, your course was absolutely fantastic, I really enjoyed learning so much and and finding out what a pleasure and rewarding skill French polishing is, I cannot wait to start practicing and continuing to develop the skills learned, thank you for all your help and support, I will send you some photos of my work and especially the little letter holder." "I have just completed a 2 day beginners course in French Polishing with Roy. I found the experience both enlightening and enjoyable. Roy is a traditional french polisher with a vast amount of knowledge and experience. 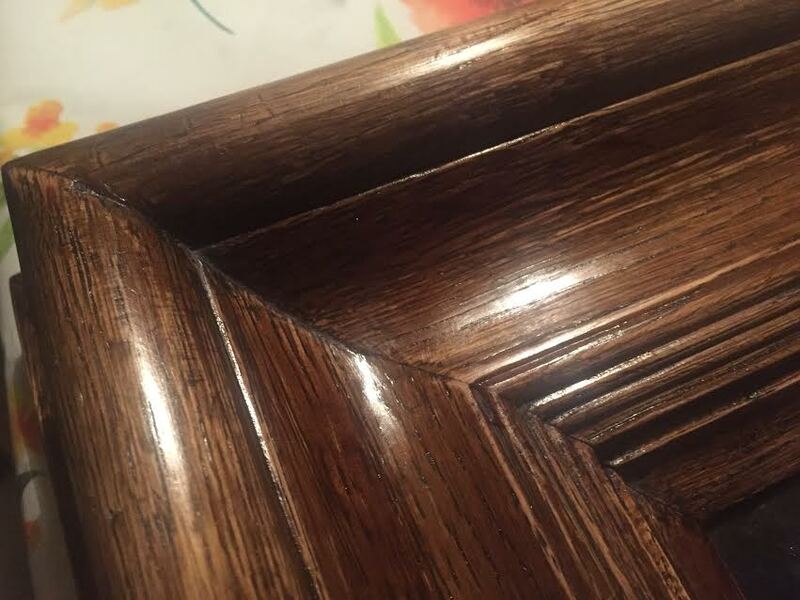 His hands on approach, guiding you through the different aspects and techniques of french polishing is excellent. I would highly recommend Roy's 2 day, one-to-one course to anyone considering learning the art of french polishing." "I was so impressed with how well you tailored the course to work for me and my table. It was quite a challenge I set us, but it made it fun. . It’s been so rewarding and I am looking forward to continuing the good work. And thank you also for the time you put into repairing the other half of the table. I feel like I learned a lot of good sense from you and I feel much better equipped to tackle other projects. I'm going to treat myself to some decent clamps too. Thank you again, and please thank Jenny as well. I really enjoyed my time with you both. " “This week I snuck off to practice the dark art of French Polishing. Some people are naturally good teachers – Roy is one of them. He is also a real craftsman – an expert French polisher – so he and I worked on my beautiful but abused late-Regency table, which had seen better days – lots of better days in fact. Before starting on such a huge project we talked about the materials, the techniques, the approach. We discussed how the table functions as a piece – there are two separate consoles, one with a simple drop-leaf to easily combine the two into a large dining table. Roy really wanted me to make the right choices for the piece. It’s clear that this table stood as two separate side tables for moist if its life. Roy gave me an insight into the forgotten reality of making such a piece of furniture entirely by hand, showing me the plane marks still visible underneath the table top. He first had me working on ‘practice boards’, fine-tuning the sanding, sealing sand de-nibbing etc. Then we hit the table, so to speak. As we cleaned it, the beauty of the Cuban mahogany revealed itself and the beautifully-crafted details started to jump out, such as the double row of inlay, probably ebony, on the lower edge. The colour and depth increased as we worked. It was reassuring to know that if I did anything really stupid, Roy would show me how to fix it. Bringing something so beautifully handcrafted back to life after so many years of abuse is exciting and rewarding, though there is much left to do. "The best course I have attended, opening my eyes to the infinite possibilities I can do and achieve with wood and French polishing. Roy is a total gem as a mentor and tutor. Recommend this course to anyone who loves wood." "Hi Roy - Just thought I would drop you a few pics of the stuff I have been working on since I did your course. Really enjoying it and started to get a nice box of tools together! I have finished the coal scuttle and am part way through the mirror. Can't say thanks enough for enthusing me to polish! Best thing I've done ever! " (Amanda from North Yorkshire) "
I spent two days with Roy in his workshop. The two main areas of study being french polishing for classical guitars and guitar restoration. Roy taught me the french polishing techniques, emphasising the guitar specific elements, in a relaxed and highly effective way. His style is such that I couldn't help but learn, ask questions and develop skill at a most surprising rate. He also has a high degree of sensitivity so I was able to understand how to polish new items but also how to preserve the feel of older items. It is also hard to explain what it is like being with Roy, as a guitar maker. He has knowledge that is truly deep and is more than willing to share it. I came away awash with ideas, suggestions and some detailed understanding, that continues to surprise me. I was most compelled by his innovations and his use of traditional practices but with a huge emphasis on locally sourced woods. To innovate, within traditional boundaries, I find most compelling. I felt a subtle, but strong, nudge in my thinking and direction. In two days I learnt to french polish but also came away with a changed view as a guitar maker. I hope some of what he said never leaves me. But most of all I had fun, learnt a lot and spent a good deal of time with a guitar making giant. "I had a great time with Roy and can't believe how much I learnt about french polishing and furniture restoration in just one day. Roy has a clear way of explaining techniques backed up with plenty of hands on practice. I'd highly recommend this course to anyone, whatever their experience." "A highly recommended course. Roy is a great teacher and two days just flew by. I cannot stress the benefit of this style of one-to-one teaching. Far better than courses where you are one of a small group. Roy can watch, assess and guide you far quicker on a personal course like this. His purpose built garden studio is PERFECT for this type of one-to-one course. If you want to be fully guided and follow the training programme devised by Roy, then after a short and useful 'materials session', you will be on the practice boards and you will soon see results before your eyes. This way the course becomes highly rewarding and satisfying very quickly. I had some self taught and DVD learnt experience of polishing already and brought numerous problems and challenges I was having. Roy instantly tailored the course to my challenges and level. I particularly appreciated how he worked with me through many restoration challenges regarding veneer cutting & matching, grain filling complex burr veneers even before we put our first coat of shellac on. We spent hours on these restoration challenges. The ability to adopt the course to tackle restoration and french polishing challenges together, end to end was fantastic. Many times during the course I experienced the ‘light bulb’ moment wishing I had thought of these solutions and ideas years ago. "Thank you for a very full and instructive couple of days. I wasn't quite sure what to expect and how much I would be able to learn, but your clear teaching and practical instruction was fabulous. I came away feeling confident that I understood all the methods and materials we used." "Just a quick email to say thank you for a most enjoyable day spent with you last Thursday. Veronica had never laid rubber to wood before but was really excited about the way her grandmother’s small table was transformed. My previous attempts, after much effort, had gone nowhere, so I was amazed how quickly (and easily) it was possible to start to get a reasonable finish; applying the right technique and with your expert tuition. My main learning point was –“its all in the vapour trail”, that explained what was going on in a nutshell." "Certificate received and greatly appreciated. With regards to the days tuition, I had a great time and have learnt much today. I can hopefully take this knowledge forward and put it to fruitful use in my new venture. Having the one to one session was fantastic. The course flowed quite seamlessly and was at a pace to suit. The venue and its facilities are a credit to you and perfectly match what was required. Your advice on how to carry forward from the end of session along with your contacts to gain the 'beginners kit' are well planned, researched and greatly appreciated. And a big thank you to your good lady for putting on such a delightful lunch. It all goes towards making the course a very enjoyable day and experience. I'm sure anybody, regardless of ability or inclination would find it a great insight into the art of traditional craftsmanship involved in French Polishing. I would not hesitate in recommending the course to anyone. " "We had a great time learning how to French polish with Roy. We found it both interesting and rewarding. He is a knowledgeable and patient teacher and taught us a lot about our piece of furniture and different wood types, as well as making us both feel we were good at what we were doing. The chest of drawers we took is coming up a treat. A good experience all round." "I attended the one day french polishing course and found it to be informative and excellent value for money. The course content included materials used in the processes, basic techniques, making french polish from scratch and its application from start to final polishing. I had requested that the focus of the day be based around the restoration and french polishing of my two classical guitars. I found the tutor (Roy) to be extremely knowledgeable about all aspects of guitar construction and the application of french polish specific to my guitars. I would recommend the french polishing course to the complete beginner or to someone with pre-existing skills who wishes to advance even more." "My partner and I spent two days with Roy. My initial thoughts when booking this course was that I would never master the art of French Polishing. Roy immediately put us at ease and explained every step. We took a very sad looking oak table which started to come to life after the first day. As well as learning the art of French Polishing, Roy patiently took us through the steps of restoring the wonky legs of the table. My partner and I now have the confidence to finish the project and experiment on other furniture. This was two days well spent. Thanks Roy. " "I would like to thank you for a great day on your French Polishing Course. This was one of the best courses that I have ever attended. I came away from your day of instruction, full of confidence and enthusiasm, wanting to put to my new found skill to use. I was a bit apprehensive about the day but your kindness and knowledge soon put me at ease. I also found that the the gentleman at Barlis Polishing was really helpful and I received my polishing kit the day after I placed my order (10% discount as well). "Roy was there to meet me as I arrived, helping me to bring in three "suitable items" and when we carried one back out seven hours later, I could hardly take my eyes off it. Roy has a very clear considered approach to teaching and a patient way of providing all the necessary information which immediately put me at ease. I first got to work on two practice boards but after some careful sanding I was sealing a long 1950's or 60's coffee table (belonging to some potentially tricky customers) before lunchtime. All the demonstrations and explanations of the different techniques have encouraged some early confidence which I am very keen to build on professionally. It was a very enjoyable learning experience and the way Roy communicated has left me with no doubt about recommending his course and his mentoring abilities. Those customers, my Mum and Dad, were "thrilled and delighted" when I turned up with their totally transformed table that now demands the need for stylish coasters! "Firstly, my apologies for not having written sooner but I wanted to complete the Art Deco table I brought with me, so I could show you the end result. I have to say I was a little nervous of a one-to-one course, not having undertaken such a hands-on learning programme before. However, the friendly atmosphere of the building and the people there, made the welcome very warm and friendly. Our classroom was just the right setting for learning and you gave me as much free space as you thought I could handle, advising and guiding as the day progressed. As you know I did not take any notes and took your word that everything I was learning was included in the notes you had provided. Indeed they were and whilst waiting for my kit to arrive, I re-typed in all of your notes, plus some of my additions to help the information sink in. This form of refresher has always been of great benefit to me plus it gives me a good set of notes with my additions and observations in my own words, for future reference. "I spent a magical day with Roy, discovering how exciting and satisfying French polishing can be. I was a total novice and had brought with me two tables and a very old ladder back chair, all of which were in poor condition. By the end of the day they had improved immeasurably and I now have the confidence to finish them and to take on new projects! I thoroughly recommend a French polishing course with Roy. He is knowledgeable, patient and very encouraging. He was happy to go over each process until I was confident with it. The notes he providedare comprehensive and will be very helpful. I think that anyone would enjoy this day out, it would make a wonderful gift." "Thank you for a most enjoyable day. I found that the day gave me the confidence to start projects. The teaching was an excellent balance of information and practical experience. I can certainly recommend it to friends." "I spent a long time trying to learn French Polishing from DVDs and the internet without getting the results I wanted. I spent a day with Roy and picked things up so much faster. It was great to learn from such a knowledgeable tutor and the day was very enjoyable. Being able to discuss things I didn't understand and get feedback as I worked was really invaluable." "I found the whole process of booking the course very easy and Roy ensured that I was aware of what items I needed to bring with me, well in advance. Upon arriving for the course, I was welcomed with a cuppa and a good overview of what the course entailed. During the course, Roy made sure that at each stage, a review session was carried out to check what I had learnt and to deal with any queries (that had not been asked during each session). The various tasks were clearly explained beforehand and every opportunity was given to practice what was being taught. I came away from the course, fully enthused and equipped with the skills and knowledge to put my learning into practice and to build up my experience. I would not hesitate in recommending attendance at one of Roy's courses." 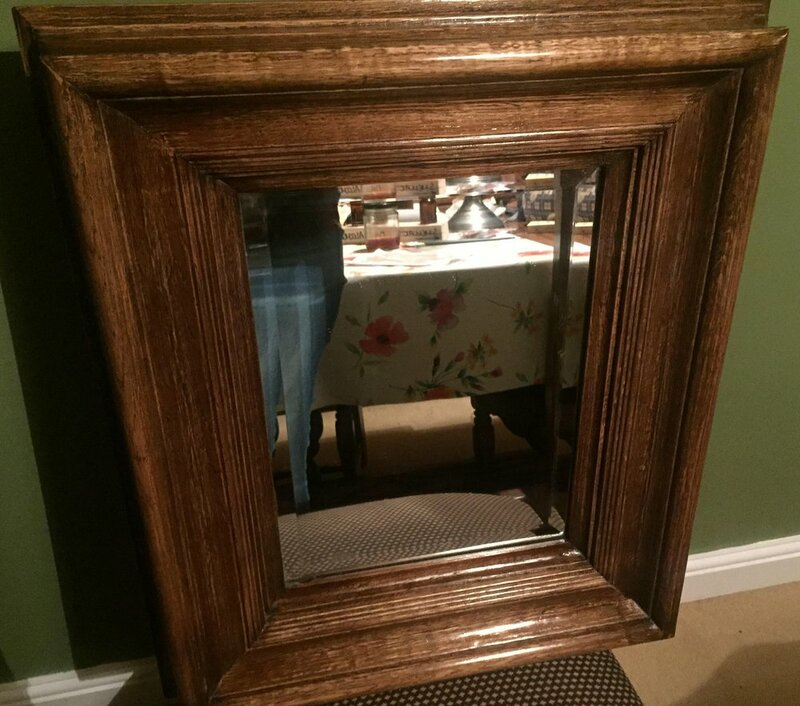 "Roy taught the art of 'French polishing' in a patient, interesting & understandable way which made the finished articles look wonderful whilst retaining their original 'Patina'. I came away with the knowledge I need to start polishing regularly and produce good results." "Although I had previous experience in Cabinet Making I started the course with no knowledge of finishing or French Polishing whatsoever. After just four days working alongside Roy on items of furniture I had bought with me, I felt full of confidence to go on and tackle my new job as a Furniture Restorer within the insurance industry. Roy's approach to teaching and passing on of knowledge is calm and clear. The course was tailor made to suit me and my needs for setting me up for in my new job. In this short time I was introduced to a wide range of materials, techniques and processes, not only this but I learnt about tools and tool maintenance too, all of which I found invaluable. Roy provides a highly informative and enjoyable course, I cannot recommend it highly enough." "A great and fun experience to repeat! Prior to this course, I had some experience with French polishing, having obtained very nice results. However, I was not able to reproduce those results and even less repeat the “magic formula”. Two days with Roy have helped me understand better the subtleties behind the French polishing technique. He’s been clear about the principles and has shown to me that the magic formula includes a “feeling” ingredient. Roy knows how to combine theory and practice in a wise and non-boring way. In fact, he really made me enjoy every moment of these two days that, unfortunately, have passed too fast. Before, finishing was a task that I was not looking forward to start. Now, I’m looking forward to finish my next project using Roy’s teachings! Thanks again!" "As a complete beginner to French Polishing and wishing to apply this superior finish to my first hand built classical guitar, I could not have chosen a better course to go on. Roy’s one day Introductory Course took me through every step of the process, clearly explaining the purpose and the objective of each stage. Being a hands-on course, Roy helped me to develop my polishing technique and to identify when subtle adjustments to the applied materials should be made. The added bonus for me was the tutor’s extensive experience in making classical guitars. Roy explained the particular challenges faced when French polishing a musical instrument of complex structure and differing woods. Having taken my guitar to the course, Roy was able to show me how to overcome these challenges to the extent that I was able to make a start on the sealing, grain filling and polishing of guitar as part of the day’s exercise. Roy’s excellent tutoring skills made the course highly enjoyable and rewarding. I came away keen and confident to complete the French Polishing." "Having wanted to learn about French Polishing for 20 years, I was pleased to find Roy's 2 day courses. I really enjoyed myself and took along a couple of Antique pieces that required some minor restoration and polishing. By going through the basic work on wood supplied by Roy before moving onto my own pieces I learnt enough to finish the French Polishing off at home on my own. The course notes that Roy supplies are written in such a way that when you read them you can hear his voice (in your head) explaining what to do. This brings back the time spent during the course and refreshes your memory giving you confidence when at home on your own. 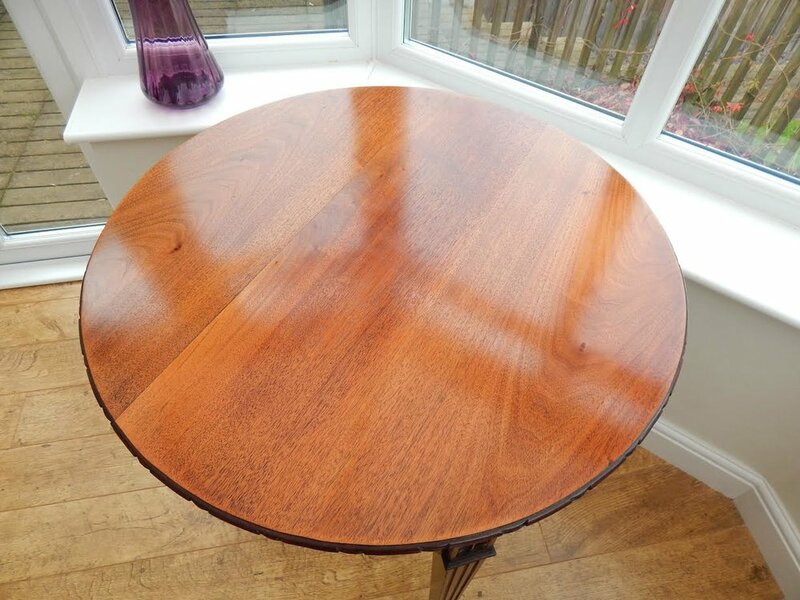 I strongly recommend Roy's course if you have an interest in French Polishing."